Last Season we profiled VEX participant Noah of Team 99484, the Knights from the Christian Academy in Japan. 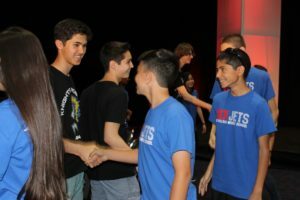 In our interview, Noah told us about his move from Lancaster, California, where he was a member of the VEX Jets robotics team at Joe Walker Middle School to Japan where he helped start a new team at his new school, the Knights. With the help of VEX Jets mentor Matthew Anderson, a mutually beneficial relationship between the two teams quickly developed. Through a series of FaceTime sessions held during practice, the teams shared ideas. This was especially helpful for the Knights, who only had one event during their inaugural season. At VEX Worlds 2016, before the “VEX Robotics and REC Foundation Q&A” the teams finally met. They had dinner after the second day of competition and then sat together during ceremonies in Freedom Hall. The Knights fared well at their very first VEX Worlds, winning half their matches. The team managed that despite the late arrival of their robot which was accidentally left off the team’s connecting flight from Detroit. Inspired by their time in Louisville, the Knights returned to Japan energized. The school’s science department expanded the program to two VRC teams. The school founded a robotics class based on the VEX EDR curriculum. Over the summer the team hosted two, week-long robotics boot camps designed to get more students involved in the program.